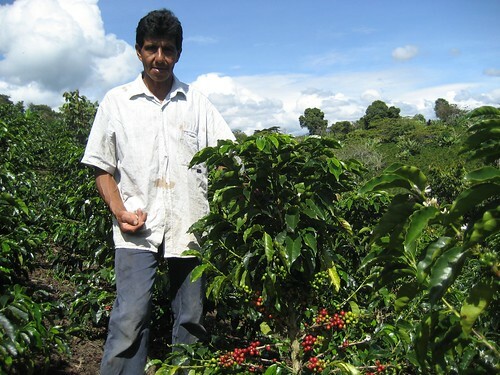 Los Naranjos has now been an award winning coffee since 2009. And once again it is an award winner with the prominent farmer in the region taking cudos Mr Carlos Imbachi. Quaffee, has actually coffee from 3 of the top winning regions. but this post is about Los Naranjos. The growers deliver their parchment lots to Virmax’s warehouse/lab (in Colombia each farmer has their own depulping and drying – their own micromill). At the warehouse the parchment goes through a physical quality control (where Virmax check for defects and yields) and the coffee is cupped (typically we do 5 cups for every 500 kg ofg parchment). Each sample is given a score, and depending on the score the coffee is assigned either A, AA, AAA categories. Final price to the growers depends on the score they achieve. As such, they have an incentive to always improve their quality. In addition, feedback is given to the farmer on the spot on how to improve quality and their farms are visited to provide advice on their land. Out of the 3 growers that compose your lot, Mr. Carlos Imbachi is a very well known farmer, as he won the 2009 SCAA Coffees of trhe Year Award and was the highest score in the 2010 SCAA Coffees of the Year Award. His coffee has also been used as Single Origin Espresso by National Barista Champios competing in the World Barista Championship. Roast used: City+ as 2nd crack begins.